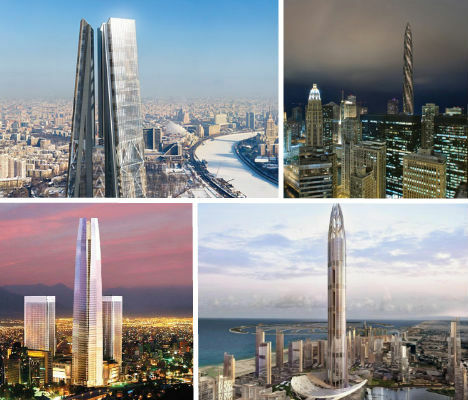 They were supposed to be shining examples of super-tall architecture, towers that celebrate the prosperity of their respective urban locations. But after the economic meltdown began in 2008, hundreds of promising projects around the world came to a grinding halt – even those in the middle of construction. Some of these 13 stalled skyscrapers may be completed if funds ever flow again, but others will sit in silence until developers come up with new ideas to take their places. It was a divisive idea from the get-go, with some Chicagoans applauding acclaimed architect Santiago Calatrava’s spiraling monolith design and others questioning its impact on the city’s skyline. But this skyscraper – which would have been the second-tallest in the world – will probably never be built. Today, the site is an abandoned hole in the ground, bereft even of construction equipment. 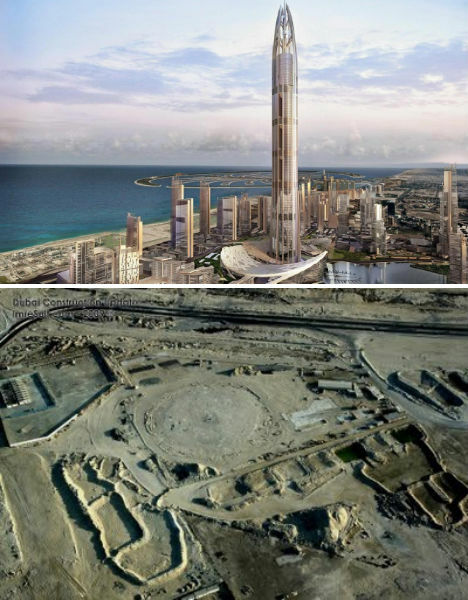 The planned centerpiece of Dubai’s famous man-made Palm Islands, Nakheel Tower – which was to be named “The Pinnacle” – would have consisted of three towers connected by ‘sky bridges’. 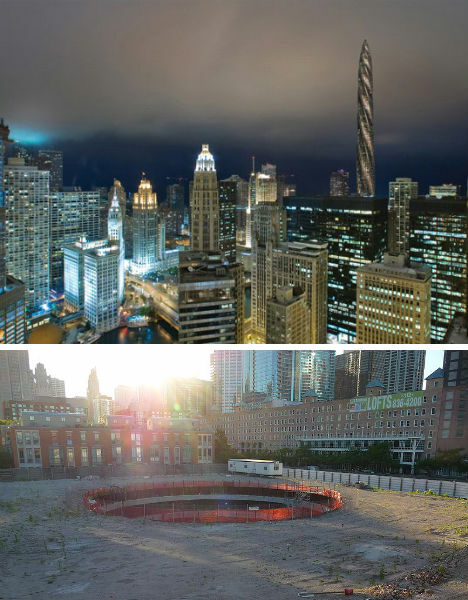 Its projected height of 4,600 feet would have far eclipsed the Chicago Spire. The tower was canceled in December 2009 after the site had already been cleared and leveled. 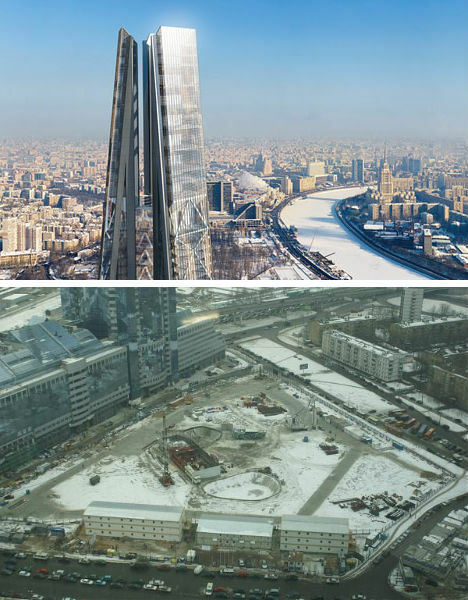 “In today’s economy, a project of such scale is no longer feasible for us and can no longer be justified.” This explanation was offered up by the developer of the Russia Tower in 2009 when the project was cancelled outright after months of inactivity at the construction site in Moscow, and the same could probably be said for every other building on this list. The Russia Tower aspired to be the world’s tallest building with 118 floors, 101 elevators, a capacity of 30,000 and a completion date of 2012. 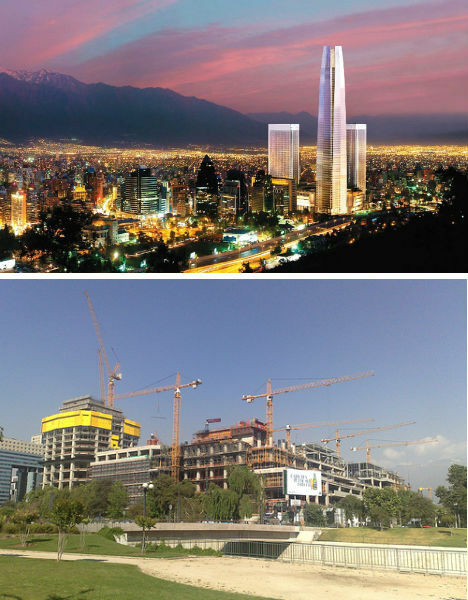 Santiago, Chile was to have been home to South America’s tallest skyscraper, the Gran Torre Costanera, a megastructure holding a six-level mall and two luxury hotels. 22 of 60 stories were completed before the project was halted in March, leaving an empty shell in the city’s business district. 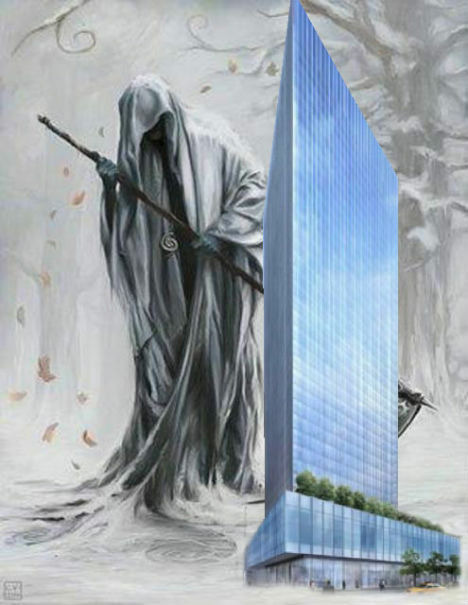 “Fans of giant gaping pits, rejoice!” cried Curbed NY when developer Boston Properties announced that it would continue construction on the foundations of the glass office tower at 250 West 55th Street in Manhattan despite the fact that the building itself will probably never be finished. Today, the site is just a fenced-off hole in the ground, like so many others across the world. 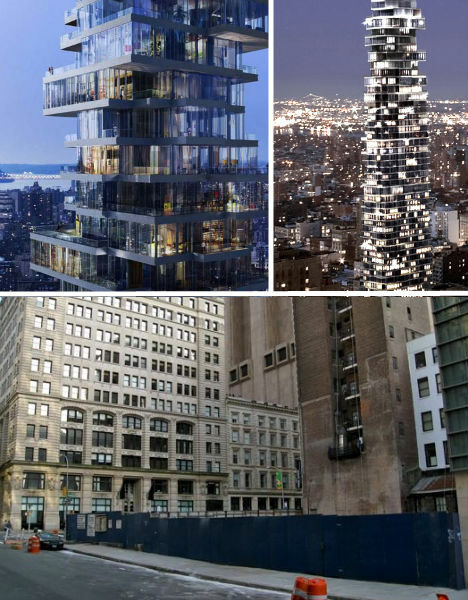 They were supposed to be “houses stacked in the sky” – upscale, spacious living spaces in the heart of Manhattan designed by Swiss architecture firm Herzog & de Meuron. Work began on the 56-story building in 2008 and was halted in early 2009. Unlike many others, this project hasn’t officially been declared dead, it’s just “frozen”, so there’s still hope that it will someday be completed. 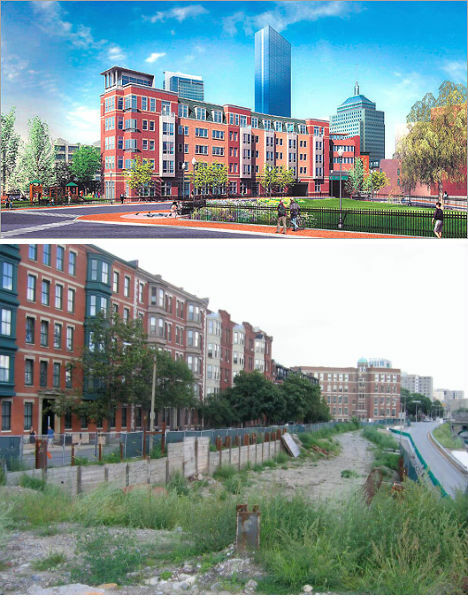 It took 13 years, but the plug was finally pulled on Boston’s Columbus Center when the developers failed to raise the necessary funds to finish it. The ambitious $800 million project would have been a complex of condos, hotels and stores straddling the Massachusetts Turnpike, but has sat empty for two years accumulating trash and graffiti. Boston.com provides a detailed interactive graphic showing what might have been. 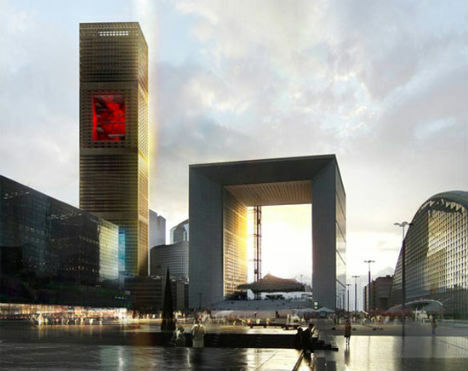 The Western edge of Paris is in need of a face lift, and famed French architect Jean Nouvel aimed to add some modern eye candy with the Signal Tower, approved for construction in 2008. But the project was shelved in 2010 as investors got spooked by the ongoing economic difficulties. Nouvel originally stated that the project would continue once the economy picks up, but his firm has since abandoned it altogether. 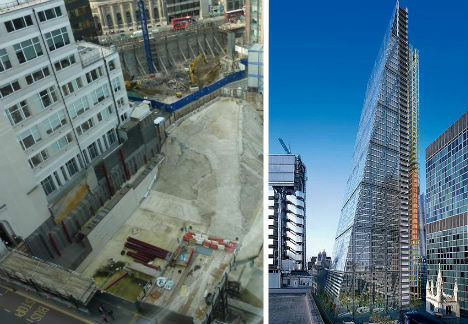 Whether affectionately or derisively, Londoners have taken to calling the design for 122 Leadenhall Street the ‘Cheesegrater’ due to its perforated steel frame and wedge shape. Construction of the new tower, which was supposed to take the place of the now-demolished 1969 building that previously occupied the site, has been delayed, but it seems possible that the 737-foot tower will someday be completed. The wedge shape is designed to preserve views of St. Paul’s Cathedral from Fleet Street. 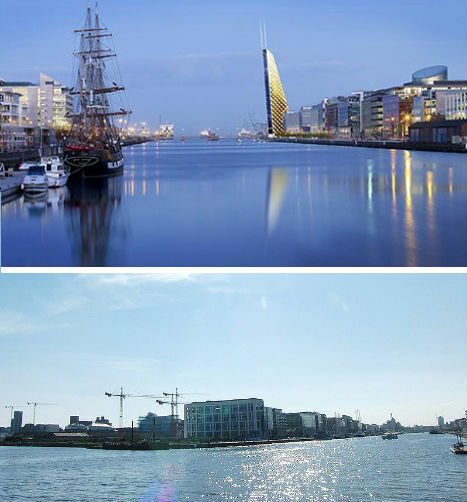 U2 isn’t exactly known for being low-profile in any capacity, so perhaps it’s no surprise that this Irish mega-band planned to build their home country’s first skyscraper and tallest building. The U2 Tower would have perched a recording studio ‘pod’ atop a 120-meter-tall structure packed with 180 condominiums and planned to include wind turbines, solar panels and an exterior facade resembling fish scales. It was suspended indefinitely in 2008. Could Lumiere still snag the title of ‘Western Europe’s Tallest Residential Skyscraper’? Maybe – if it ever comes back from the dead. 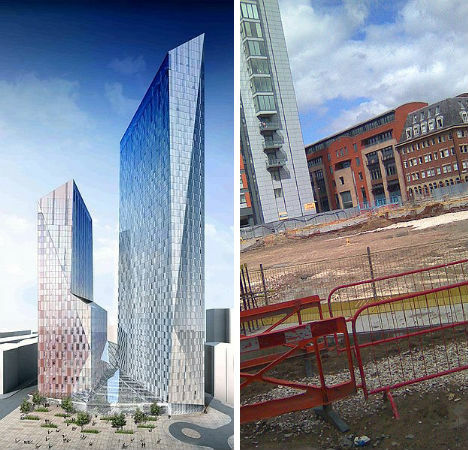 The project in Leeds, England was put on hold due to the credit crunch after foundation work began in 2008 and the developers long hoped that their vision for the two glass towers would someday come to fruition. However, in August 2010 they announced that they would enter voluntary liquidation, making completion unlikely. 510 meters tall and 108 stories, the Burj al Alam is quite a building. 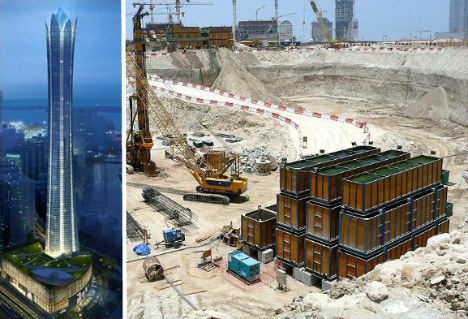 Designed to resemble a crystal flower, this skyscraper is under construction in the business bay area of Dubai and is slated to include 74 floors of office space, a 200-suite hotel, 27 floors of apartments, a sky garden, a Turkish bath and a helipad. The project has been delayed and renewed so many times since its inception in 2006 that it’s unclear whether it will ever be completed.